A dental insurance waiting period is the length of time after purchasing your dental benefits plan that you must wait before you can use your full coverage. During the dental plan waiting period, the dental insurance company will not pay for certain procedures. A dental benefits waiting period may last anywhere from a few months to a full year, depending on the type of plan you have purchased and the insurance benefits wording. The details of what is covered in the plan immediately versus what coverages are subject to a waiting period will be clearly outlined in your plan contract. After the waiting period is over, then full benefits become accessible to you. If you had previous dental insurance, you can present the information to your new dental benefits insurance plan provider, and they may be willing to waive the waiting period in cases where there has been no break in coverage. If you are purchasing new dental insurance benefits because you no longer work for the employer who used to provide it for you, you may consider contacting the same benefits plan insurance company and request an individual plan; this may waive the waiting period requirement. The dental insurance company chooses to use a waiting period, so customers are not just buying dental insurance only when they have piled up a lot of dental procedures that they want to get covered and then later just drop the dental insurance after the dental insurance policy has expired. Typically, the dental plan will not apply the waiting period to all benefits, as it is understood that the plan will pay out on certain basic coverages every year for dental benefits plan members anyway. Basic: Basic procedures may have a three to 6 month waiting period, and "Major" procedures may have a 6 month to ​a 1-year waiting period. Preventative: Preventative procedures may not have any waiting period. Therefore some benefits may be accessible despite a waiting period, such as X-rays, cleanings, fluoride treatments. Major Work: Major work should be defined in your policy wording and may vary from company to company. Beware of taking on major work without consulting with your plan first. If you decide to buy a dental benefits insurance plan because you just found out that you need a crown, the insurance waiting period could prevent you from being able to cover the procedure immediately when you purchase your dental insurance. Waiting periods can last up to a year on certain major procedures. Example 1: Joan needed a crown. She contacted her dental insurance company to see what coverage she had for the procedure. Her insurance company said that she did not have any coverage for the procedure since she only had her dental insurance for 3 months and any crown procedures had a 6-month dental insurance waiting period. One the waiting period has elapsed, then dental benefits will be fully accessible. Example 2: Anna wants to visit a dentist for a checkup and cleaning, but her dental plan waiting period is not over yet. She is worried that the dentist will need to take x-rays and charge her a lot for these services. She calls her dental benefits plan administrator and finds out that although she has a 1 year waiting period for "Major" work like crowns, and bridges, that all the basic coverages are included. She is delighted to find out that her x-rays will be covered, as well as her cleaning, and if they find any cavities, her plan will cover that too. Since every plan is different, she was happy she called as was able to get access to some of her benefits right away. If a dental procedure is required but is excluded due to the dental insurance waiting period, ask your dentist if there is anything they can do to help you manage the cost. Sometimes the dentist may consider giving you a discount or consider payment plans. Waiting for the waiting period to be over to do major dental work may not be a good idea. 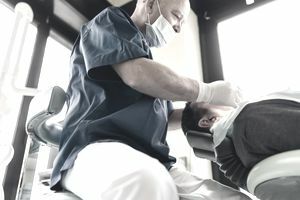 Your dentist will be able to give you their professional opinion, however if you do the math, most coverages that are limited by a dental insurance waiting period may only be covered up to 50%, so letting a problem get worse over several months to wait it out may cost you a lot more than your dental insurance would even be paying out. Your health has to take priority. Also, remember that different dental benefit plans also include maximum amounts payable and deductibles so you will want to check these numbers out as well to understand if the waiting period is costing you anything. Edward needs to have "major work" done on a tooth, as defined by his plan, it is not covered under his dental insurance because he is still under the waiting period. The cost of the procedure is $1500 and the dental plan would have only paid 50%. Also, the maximum payable for Edward's plan per year is $1500. He decides to get an estimate from his dentist of all the other basic work to be done, like having several cavities filled, x-rays, cleaning, and other basic and preventative treatments, Once he reviews everything, and calculates the deductibles, he realizes that he would hit the maximum of his plan even if the waiting period wasn't in place. He decides to go ahead with the work and get a payment plan with the dentist, and use the insurance to do preventative treatment covered by the plan to prevent this from happening again in the future. A dental benefits waiting period can also be used as a way to curb dental insurance costs. The longer the dental insurance waiting period, the lower the dental insurance premium may be. This strategy is particularly useful if you have been regularly maintaining your teeth to avoid those major dental procedures and visits. Entering a dental insurance plan if you have not been covered before can be difficult and seem expensive, but the long-term advantages of getting basic dental insurance coverages can save you thousands of dollars in the long run.